Two years ago the most trouble Ellen Gerhart had faced with the law was a parking ticket. Today, standing on a wide swath of cleared forest overlooking miles of mid-construction natural gas pipeline the 62-year-old retired school teacher and mother of two has three arrests on her record. All for the crime of standing on her own property. 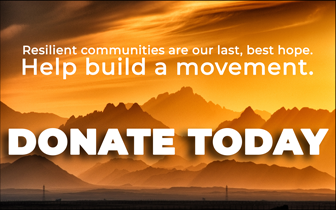 Energy Transfer Partners is probably best known as the owners of the North Dakota Access Pipeline that the Standing Rock Sioux Tribe resisted through the depths of winter and continues to do so to this day. The network of natural gas pipelines that cross the country rivals the complexity of the natural water systems, and Huntingdon County, Pennsylvania is now in the crosshairs of the industry. In central Pennsylvania Ellen Gerhart’s property lies about midway along the length of the Mariner East 2 pipeline that reaches from west to east across the state. It is slated to carry a variety of natural-gas liquids under high pressure to the coast and then exported onto the international markets. This project is not without opposition, however. 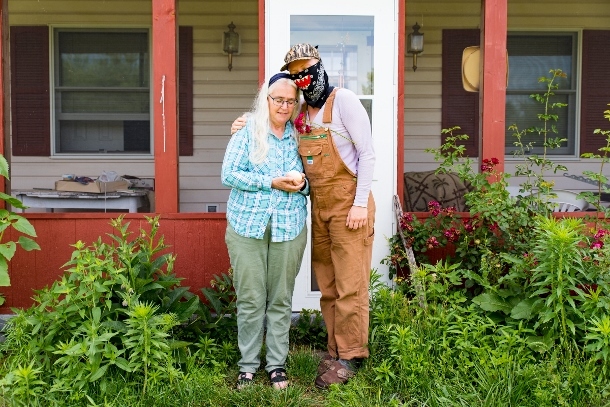 The Gerhart family are one of a number of private property owners across the state who object to their land being confiscated using eminent domain laws and used to further global climate destabilization. 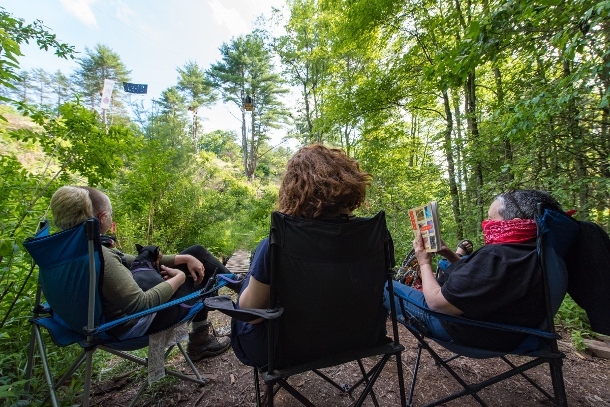 When her parent’s land was initially under threat, Ellen’s daughter, Elise, began a tree-sit on March 29, 2016 on the property to prevent Sunoco Logistics (now Energy Transfer Partners) from clearing forest for a pipeline easement. 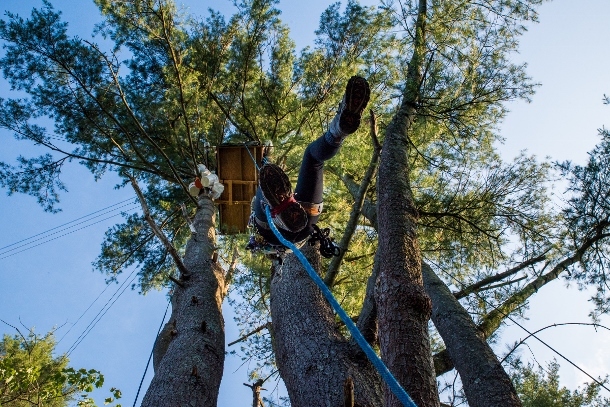 While perched on a small wooden platform roped to trees dozens of feet off the ground, Sunoco workers pulled down neighboring trees threatening to topple Elise from safety. This first attempt at tree defense gave the Gerharts enough time to use legal process to delay clear cutting and call for people to join them. Today, Camp White Pine is the rebirth of that first attempt and has developed into the most extensive tree-sit on the East Coast. Multiple platforms are occupied by members of the camp to ensure the pipeline does not cross this parcel of land nor endanger the pond currently occupied by a loud chorus of bullfrogs. Ongoing legal action by Energy Transfer Partners, and the general trend of legal decisions against property owners and in support of private corporations claiming to act in “the public good,” however, place the defenders in a state of uncertainty. Both the Gerharts and Camp White Pine, although it’s hard to draw any clear delineation between the two, are determined that the pipeline will neither be built on their property nor at all. Labeled as “eco-terrorists” by the company, the term is as inaccurate as it is offensive. The community meets together regularly for emotional and physical support. Small medical issues are addressed with timely concern, dietary needs are supplied with joy, the grounds are kept meticulously and each person, whether veteran or newcomer, are met with gratitude and generosity. Often referred to as Mama Bear, Ellen holds the title well. Her long silver hair flows down over her shoulders in abundance. She holds her face in smile despite the unclear future for the home she has owned for 35 years. A retired public school teacher, she is a quick learner herself. She has had to study up on nonviolent direct action, media relations and how to interface with police and security personnel. Each of these curricula, and more, she takes in a patient stride that carries her around the family home, chicken coop and 27-acre property on a daily basis. The sad irony, not lost on any at camp, is that eco-terrorism is going on unabated not more than a mile away across local highway 829. Each day workers carve up forest and land to lay 20-inch pipe for carrying pressurized natural gas liquids, which will pose a dangerous threat to anyone living or working nearby. In the case of a rupture or explosion lives and homes are at risk, including nearby Raystown Lake, as well as the immediate natural environment and ultimately the global climate. The Gerharts, and those at Camp White Pine have warrior hearts. Their spirits are gentle and generous, capable of embracing each other and a vision of a world powered not by corporate greed but by the quality of people’s relationships with one another and the environments they live in. It is a future they believe in, and one they struggle nonviolently for. 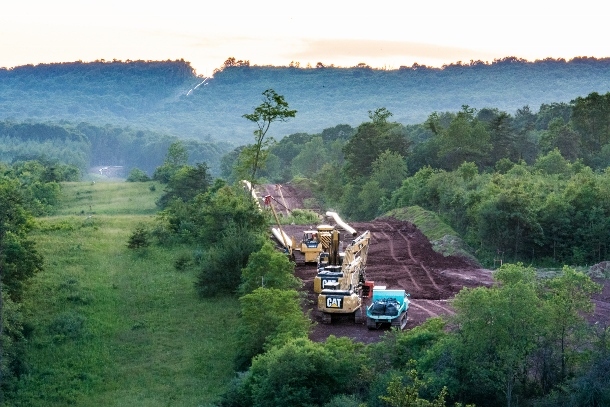 On June 27, the Gerhart family and Camp White Pine supporters will attend Huntingdon County Court where a decision on an injunction allowing Energy Transfer Partners to resume pipeline construction on the property is expected. The family’s eminent domain case is currently under review by the Pennsylvania Supreme Court and they claim any injunction would violate their rights to pursue legal due process. They are asking for supporters to join them and plan to continue their campaign against the pipeline’s construction regardless of the court’s decision.